Eagerly, my mom Marguerite (also a chaperone) and I started taking pictures. We got our bags and met David (in person from the program) and one of the La Courneuve program volunteers. He took all out bags and got our passport verified and stamped. David and our group took the train toward the hotel and then walked the rest of the way. Surprise, the La Courneuve program volunteer appeared with his little green van filled with our bags. Then we took out our bags and went to the hotel and got assigned with a buddy. I got assigned with Lanish so we took our bags to our tiny room and unpacked. A tiny room with a bunk bed, sink, mirror, TV, a bathroom similar to a port-a-potty and a small shower. After unpacking, everyone slept for an hour. Later we walked to a small restaurant which had no hot dogs, so we all ordered burgers, fries and cokes in French ourselves. We went back to the hotel and slept, not knowing what awaited us the next day. A view of Paris. Photo by Alisha Jacobs. 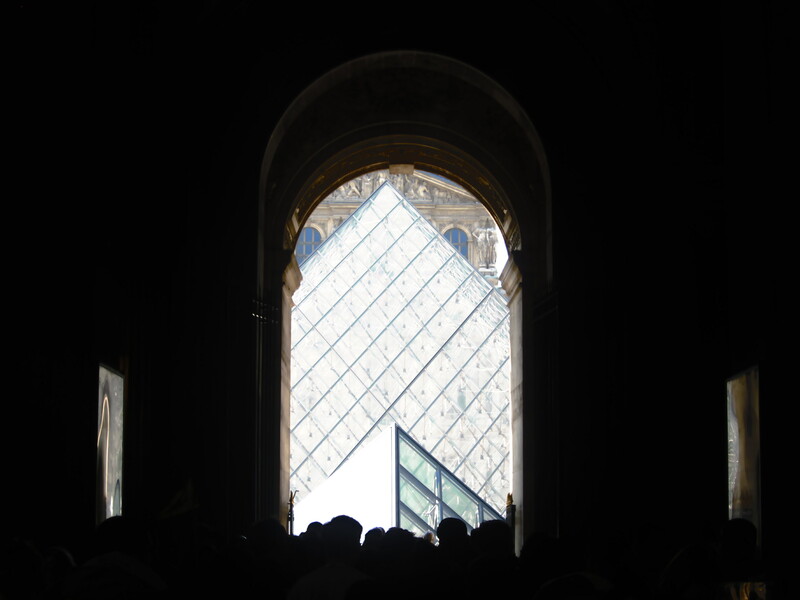 I woke in amazement thinking “I’m in Paris.” I had problems – well, we all had problems adjusting to the time. Every day, we had 3 events so we were always busy. I admired the old buildings and brick streets. It was such a beautiful place even though we only walked a few blocks. Everything we saw from the streets to the buildings had a story and is connected to Paris’ history. 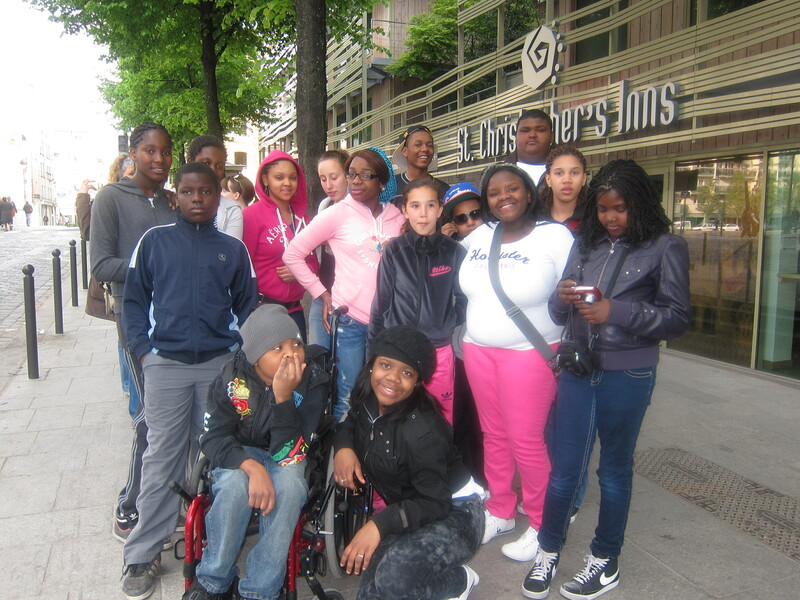 We moved out of the hotel and into the hostel and then we met the French kids from the La Courneuve program and ate with them. We went on a tourist boat ride. The boat announced the name of every building down the canal. There were boat houses, the Eiffel Tower and statues. That night I ate “Greek” – some meat similar to gyro but with another type of meat. We went to Notre Dame, a large Cathedral which I’d read about in history books. We waited in a long line full with all types of people – peddlers selling pictures, waiters, etc. We walked in together but got lost because of the huge crowd of people but we soon found each other. After we walked through some of the most ancient streets, we went to eat. Then we went to our rooms to relax for the rest of the night. We went to La Courneuve where our French friends threw a huge party for us. All day we made friends and played sports. We watched our French and American friends’ slide shows. Both group photos were presented in the photo exhibit. It made me feel like a star knowing everyone was looking forward to viewing my pictures and other children’s pictures as well. I had the honor of presenting our appreciation speech from the Chicagoans. We also visited the Place De La Concorde with its huge triangles and the Champs D’Elysses, which is basically like the Magnificent Mile. We went to Parc Asterix, an amusement park based on a comic book which turned out to be a lot of fun. I thought it would be too kiddy, but it wasn’t. Lastly, the French kids had to leave and we all cried. We exchanged information to keep in touch on Facebook. That night, we packed and went to sleep because we had to wake up at 4 in the morning, Paris time. This entry was posted	on Friday, July 1st, 2011 at 10:28 pm. You can follow any responses to this entry through the RSS 2.0 feed. You can leave a response, or trackback from your own site.